Final Conference: all deliverables available! During two conference days we welcomed almost 200 (social) entrepreneurs, policy makers and academics. We would like to thank everybody for being there, for helping out and for adding their voice to the debate. Below you can find all necessary documents, videos, pictures and presentations to get inspired even more, or to relive your favourite moments of the conference. You can find all conference photos in our Facebook album. Click on the respective speakers to download the presentations in PDF format! Click on the links to download the requested documents. How can social entrepeneurship break through? Post-event materials of the International SEFORÏS Conference in Birmingham available! On 9 December 2016 SEFORÏS held an International Conference in collaboration with Aston University in Birmingham. The aim was to combine both research findings from SEFORÏS researchers and practical examples from social enterprises in Europe and China as a basis for discussion and future recommendations for policy makers. More than 75 social entrepreneurs, researchers and policy makers joined us, with lively discussions and debates as a result. The conference programme can be found once again via this link. Our next, and final, conference is taking place on 16 and 17 March in Brussels! Save the date! Keynote by Professor Johanna Mair, Hertie School of Governance, Germany & Stanford University, USA: "Innovation and Scaling - How effective Social Entrepreneurs create Impact"
Presentation by Dr. Miriam Wolf, Hertie School of Governance, Germany: "Governance in Social Enterprises. Insights from SEFORÏS"
Presentation by Assoc. Prof. Chloé Le Coq, Stockholm School of Economics (SITE), Sweden: "Financing Social Enterprises. Insights from SEFORÏS"
Presentation by Dr. Alain Daou, KU Leuven, Belgium: "Innovation in Social Enterprises and Social Innovation. 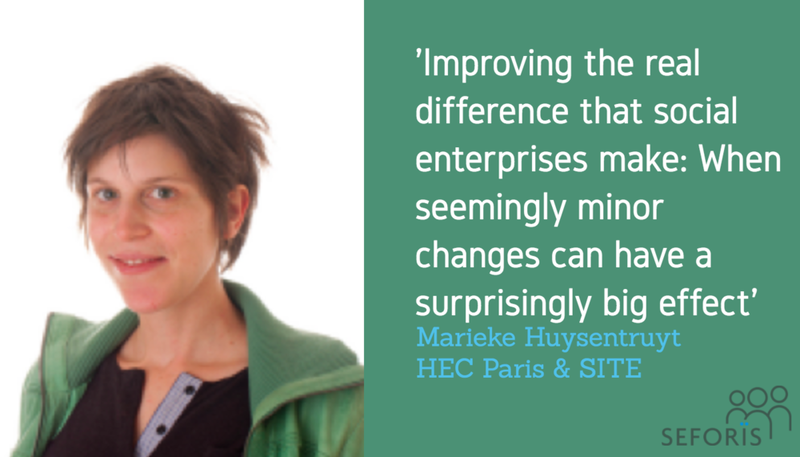 Insights from SEFORЇS"
Presentation by Dr. Marieke Huysentruyt, HEC Paris, France & Stockholm School of Economics, Sweden: "Scaling Impact in Social Enterprises. Insights from SEFORЇS"
Presentation by Dr. Emma Folmer, Aston University, UK: "Social Enterprises across Countries: More Similar than Different? Insights from SEFORЇS"
Check out the conference photos in our Facebook Album. The incorporation of LUISS Guido Carli in the SEFORÏS consortium represents an important step in the consortium efforts to spread the SEFORÏS research methodology and project objectives to countries outside of the original set of SELUSI and SEFORÏS countries. SEFORÏS at LUISS will be coordinated by prof. Tomislav Rimac who has been a principal investigator from the beginning of the project, ensuring a seamless transition. SEFORÏS activities will be carried out within The Ethics, Responsibility and Sustainability Hub (ERSHub), LUISS center of excellence whose aim is development of expertise on sustainability and related topics and development and implementation of solutions for real social needs by filling the gap between development of new ideas and their implementation. SEFORÏS joins other LUISS initiatives such as the International Center for Research on Social Innovation (CeRIIS), the Program for Student Volunteering (VolontariaMENTE), and the Laboratory for the Governance of Commons (LabGov) that work together towards making LUISS an Italian and European center of excellence for sustainability and social and solidarity economy. Founded in 1966, LUISS Guido Carli is one of the major private Italian universities strongly committed to the development, transfer, and dissemination of knowledge, by conducting research activities and educating talented individuals. Recognized for its academic excellence, LUISS comprises four Departments - Economics and Finance, Business and Management, Political Science and Law – and three schools – LUISS Business School, LUISS School of Government, and LUISS School of European Political Economy. Thanks to its affiliation with Confindustria, the Confederation of Italian Industry, LUISS has developed strong corporate links that offer reciprocal, unique research opportunities for LUISS researchers and business practitioners. Department of Business and Management coordinates research activities across the areas of business administration, management, innovation, and ethics, responsibility, and sustainability. Through theoretical and applied research in collaboration with academics from national and international universities as well as from public and private organizations, its faculty aims to develop new management knowledge, approaches and methods to contribute to the academic debate as well as provide a long-lasting impact in the practitioner world. SEFORÏS is proud to announce an important milestone: we have surveyed over 1.000 directors of social enterprises in China, Russia and the EU. SEFORÏS has surveyed over 1.000 social enterprises across Europe, Russia and China. The survey will provide us with a bottom-up view that should help us better understand the role of social enterprise in leading to a more inclusive, innovative society. "We are very proud to announce this important research milestone for SEFORÏS. 2016, therefore, looks hugely promising. I very much look forward to working with all of you, to help ensure that we make a big, positive impact on the research frontiers, as well as on actual social entrepreneurship and the ecosystems social enterprises rely on", says Marieke Huysentruyt, principal investigator and member of the SEFORÏS Academic Advisory Board and co-founder of Oksigen Lab. Critical to the success of the survey was integrating the issue of context - how formal and informal institutions, social capital environment and resources affect social enterprise performance and vice versa. In conjunction with the analysis of governance, impact, financing and innovation, this should allow us to develop thoughtful insights for new policy geared toward social entrepreneurs and social innovation. In the spring of 2016 SEFORÏS will publish country reports for each of the 9 participating countries. They will contain first analyses and profiling of social enterprises in the 9 countries separately. This will later lead to comparative analyses. On March 26, 2015 Professor Tomislav Rimac (UAB, Spain) hosted a delegation of high ranking regional officials consisting from mayors of 8 cities from 5 South Korean provinces and the CEO of Global & Local Brain Park. During past few years, it has become a common occurrence that our consortium researchers are invited to give presentations about project activities and findings to diverse audiences consisting of practitioners, policy makers, and academics. SEFORÏS and SELUSI good reputation has been spreading far and wide. During past few years, it has become a common occurrence that our consortium researchers are invited to give presentations about project activities and findings to diverse audiences consisting of practitioners, policy makers, and academics. While we have always seen these events as a form of recognition of our efforts and an indication that our ideas and work create real-world impact, we have also used them to engage in a dialogue with other actors and to critically re-examine our thinking about complex phenomena of social entrepreneurship and social innovation. The most recent example occurred on March 26, 2015 when Professor Tomislav Rimac hosted a delegation of high ranking regional officials consisting from mayors of 8 cities (SeongDong-Gu, Nowon-Gu, Gemcheon-Gu, Gwangsan-Gu, Nam-Gu, Asan City, Nonsan City, Yeosu City) from 5 South Korean provinces (Seoul, Gwangju, Incheon, Chungnam, and Jeonnam) and the CEO of Global & Local Brain Park. They came to Barcelona to learn firsthand about SEFORIS and SELUSI projects and to discuss the implications that findings of these projects could have on development of social economy and sustainable regional development in South Korea. During one-hour presentation Professor Rimac outlined the main objectives of the projects, presented relevant results, and talked about the success of ethical banking during the years of crisis. In addition, he informed the South Korean guests about the most recent initiative for expansion of SEFORIS activities to countries outside of the current consortium. The visit concluded with a lively one-hour Q&A session that brought to light similarities but also differences between social economy and sustainable regional development in Europe and South Korea. In the coming six months, SEFORÏS will survey a 1000 social enterprises across Europe, Russia and China. No small feat that has been prepared very thoroughly by all team members of the SEFORÏS consortium. The preparation culminated in the training in Brussels of 18 team members who will start contacting the social entrepreneurs in the 9 countries that are included in the research. China, Germany, Hungary, Portugal, Romania, Russia, Spain, Sweden and the United Kingdom are the 9 countries that have been included in the SEFORÏS large-scale survey program. Critical to the success of the survey is integrating the issue of context of each country - how formal and informal institutions, social capital environment and resources affect social enterprise performance and vice versa. In conjunction with the analysis of governance, impact, financing and innovation, this should allow us to develop thoughtful insights for new policy geared toward social entrepreneurs and social innovation. Since it is so critical to include the local context in which social entrepreneurs operate in the survey in a meaningful way, it was important to organize a training week for the team performing the survey in the 9 countries. They will exchange experiences as the survey work progresses. They especially need to carefully gauge the deeper sense of all the questions put to the social entrepreneurs, so nothing is lost in translation, or worse, results become incomparable. Another puprose of the training was to make it possible for the surveyors to familiarise themselves with the software and database tools they will work with. Austin Dempewolff, coordinator of the survey for NPI, gave some insight into the the promise but also the challenges for their work in China. "It's very exciting to be able to start the actual survey after an intense preparation that has taken up to 3 months", tells Austin Dempewolff. "I believe the survey will yield very high quality data. All the more exciting is the fact that for China this will be the first large-scale academic research into the phenomenon of social entrepreneurship. The term and concept 'social entrepreneur' has a very broad meaning in China: it can mean anyone that starts up an initiative with a social goal, not just those that actually run an enterprise or company. That is where part of the challenge lies for our part of the SEFORÏS survey." What's so special about Social Entrepreneurs, anyway? "Social entrepreneurship has a long tradition in our country. At the same time there seems to be a new wave of social enterpreneurship", says Christine Alamaa of SITE in Sweden. Sweden, known as an inclusive society and famous, even, for its social policies. What makes the role of social entrepreneurs still relevant there?. "What's interesting to me about social entrepreneurs in my country is that it is one thing to be able to identify a problem or void in society and have feelings about what things should be like, it is quite another to actually be able to translate that into action, and 'Do something about it' so to speak. That is what sets social entrepreneurs apart in a significant way and why I look foward to speaking to so many of them in the forthcoming months. " The training week was an effort led by SEFORÏS consortium member Oksigen Lab: Dr. Marieke Huysentruyt, Ira Lardinois and Anna Kint gave the training sessions. They deserve recognition for a job well done. Thank you! See more photos of the training week in Brussels, here. In the coming six months, SEFORÏS will survey 1000 social enterprises across Europe, Russia and China. The survey will provide us with a bottom-up view that should help us better understand the role of social enterprise in leading to a more inclusive, innovative society. We recently concluded an intensive training of the international team of 'surveyors' in Brussels and are excited to announce the imminent start of the survey. Critical to the success of the upcoming survey is integrating the issue of context - how formal and informal institutions, social capital environment and resources affect social enterprise performance and vice versa. In conjunction with the analysis of governance, impact, financing and innovation, this should allow us to develop thoughtful insights for new policy geared toward social entrepreneurs and social innovation. SEFORÏS has recently concluded an unusually high load of interviews all relating to 27 social enterprises in 9 countries. The aim is to enrich our understanding of social enterprises through the in-depth study of especially chosen social enterprises. No less than 236 interviews were conducted. The cases gather information about governance, finance, innovation, impact and context, the 5 core research areas of SEFORÏS. The formal analysis is still in preparation but some preliminary conclusions can already be highlighted. SEFORÏS researcher Georgiana Nitulescu, who coordinated the case studies, jotted down some first insights. You can read them here. Enhancing our understanding of the role of social enterprise in leading us to a more inclusive, innovative society. Developing insights about the social enterprises and their local context – How formal and informal institutions – social capital environment and resources affect social enterprise performance and vice-versa. Developing thoughtful and new policy-relevant insights and stakeholder-relevant recommendations. As part of the large-scale data collection efforts, we will collect rich data on the sorts of policy recommendations that social entrepreneurs themselves wish to make, and the visions they hold for society. We aim to enrich our policy recommendations with these bottom-up views: the views of a 1000 social enterprises across Europe, Russia and China. It's a big challenge and we are looking forward to it. Prof. Johanna Mair from the Hertie School of Governance in Germany was invited to the Chancelllery of the Federal republic of Germany together with a number of other high-level international experts in order to discuss social innovation and social entrepreneurship in Germany, during the 2nd International German Forum. The International German Forum was created by the Chancellor of the Federal Republic of Germany, as a new forum for interdisciplinary exchange on internationally relevant, future-related issues. It offers a platform for politics, business, science and civil society experts to discuss ways of shaping economic, ecological, social and political transformation processes and elaborate concrete plans of action. "What matters to people – innovation and society"
The key issues discussed during the two-hour meeting with the Chancellor Angela Merkel ranged from how social enterprises can contribute to individual and collective well-being to how they are organized and how their innovative potential can be unleashed at a broader scale. Merkel emphasized that particularly developed industrial nations like Germany face challenges to remain innovative because they rely on a long history of well-solved problems. This, she suggests, leads to a tendency to continue solving problems in the way they have always been solved. She also mentioned the particularity of the German context where social welfare organizations are embedded in a highly institutionalized system and have a long history of solving social problems. In this context, enabling change and innovation is a particular challenge not only for the government but also for a variety of actors in the social sector. In this vein, by developing a deeper understanding about the organization of social enterprises, the particularities of the national contexts they are embedded in and how they contribute to a more innovative and inclusive society, SEFORÏS is very timely in meeting the need for policy to be supported in developing thriving environments for social innovation in Germany and elsewhere. More on the 2nd International German Forum here. SEFORÏS has recently concluded a first survey of social enterprises in 9 countries. The aim was to enrich the understanding of social enterprises by conducting 27 in-depth case studies, 3 per country. The cases gather information about governance, finance, innovation, impact and context at the heart of these social enterprises. The formal analysis is still in preparation but some insightful preliminary conclusions can already be highlighted. As the field is still expanding in countries like Hungary, Russia or Portugal, social entrepreneurs express their desire to learn more about social impact measurement. In Spain, Sweden and UK, competition seems to be rising between social enterprises that emerge from different sectors. On the contrary, sharing is sizeable within and across sectors and the perception that sharing important strategic information could be disadvantageous, in terms of competence, is, at a first glance, not widespread. One topic about Chinese social enterprises that has come up during this research is the issue of profitability—how Chinese social enterprises can handle the issue of profits and how profits are treated in their operational model. It's especially interesting given that many Chinese social enterprises legal status (Private Non-Enterprise) explicitly prohibits them from "engaging in profit making activities" (rather than just prohibiting annual profits). In Spain and Germany, there seem to be differences between the formal structure set up and the internal "soft" mechanisms used to balance between social/commercial goals. Early insights show that social enterprises are compelled to choose a given organizational form in order to be able to develop their commercial activities, but internally, they preserve a different, more informal and flat organizational form. The external organizational form is used to interact with external actors and allows them to access different financing sources and the internal organizational form allows to better organize the task and coordination of the people involved. Social entrepreneurs from Russia and Germany speak about the lack of knowledge in order to initiate any legislative changes, not knowing who to approach and what procedure to follow. In Belgium, according to the city officials, in the past years, more attention has been paid to the social entrepreneurship sector, e.g. city invested in the development of a new site for the social economy enterprises. They think the social economy should become fully self-sustainable (without having to depend on subsidies). Similarly, in Spain, we see more and more initiatives from regulators, at regional and national levels, to promote and help develop social enterprises. Networks seem to be of vital importance in accessing resources. Network connections are for instance important in accessing human capital – recruiting employees & board members. Networks and social capital become more and more important for the development and growth of social enterprises. These networks not only promote social enterprises but allow for the replication of their models in related/unrelated domains, creating strong bonds at regional and national level. Even if this part of the SEFORÏS research survey has reached its end, we will continue to monitor the activities of all the social enterprises included in the study, in order to follow up and investigate on the different emerging trends at national and international levels. wellcome is one of the first social franchise organizations in Germany and offers support to young families in the first months after a baby is born. wellcome connects families with volunteers who help by taking care of the baby or elder siblings . With this concept, wellcome provides an answer to many of the challenges that derive by current demographic and social trends in Germany. This includes the declining availability of inter-generational support, rising mobility and the loss of neighbourhoods. Midlands Together is a social enterprise (CIC) established in 2013. They buy refurbish and sell empty properties. Their aim is to create jobs for people who have been in prison. They provide training and support through mentors dedicated to seeing employees succeed. Volontärbyrån works to encourage volunteering. Through facilitating for people and organisation to find each other at their internet-based matching-site; by spreading deep knowledge; customising packages for enterprises desiring happy employees, they both strengthen and renew the civil sector engagement. Dynamis is a Living Lab for Sustainability, generating synergies between Enterprises, Citizens, Universities and Public Administration through social innovation and technology. During the consortium meeting in Shanghaï thoughts were exchanged by the SEFORÏS team on how the scene of social entrepreneurship differs between Europe and China and how the NPI Social Enterprise Forum in Shanghaï created a place for different (opposite) opinions. Marieke Huysentruyt rephrased some of these thoughts. I was struck by the very different tone and language that the Chinese use when discussing the role and development of social entrepreneurship in China. Various Chinese speakers underscored the virtue of and need for patience: let the social enterprise phenomenon in China take root and grow organically; don't rush, but give it time; etc. This starkly contrasts with the loud calls for action and change now (or better yet, yesterday) that we commonly hear in EU circles and echoed across EU Member States. Relatedly, the Chinese tone is also far less aggressive, less combative if you will, than the one Europe uses to describe societal goals and targets. Whereas Europe is fighting poverty, China is alleviating poverty. In Europe, there is the continual struggle – for one say to keep solidarity high; the Chinese are far less in combative in their rhetoric. To be sure, all this doesn't mean the Chinese are less ambitious. Not at all. The reach, scale and speed of growth of Chinese social enterprises, like Be Better, is mind-boggling, something we Europeans really 'struggle' to grasp – can only dream of! I was also struck by the very wide range of viewpoints that the Forum brought forward. The opposite extremes were there – some placing all the bets on businesses to pick up and resolve societal challenges, others on the pure charities. And all the shades of grey that lie in between these two extremes were equally heard. This openness, letting very diverse players articulate and promulgate a role and vision, is I dare say less common in Europe – where we seem more preoccupied with building up walls, segregating views and schools of thought. Before diving into the extensive qualitative and quantitative research ahead – notably the 25 case studies and 1000 surveys- we tried to effectively take stock of the state of social entrepreneurship in the participating SEFORÏS countries. Our aim was to collect useful facts, figures and trends about social entrepreneurship in each of these countries and this in relation to our 5 core topics of study: context, organization, impact, financing and innovation. In addition, we sought to feel the temperature of the public debates, public opinion and alive myths. You can readily download the full reports online – structured either by country or by topic. Below, we highlight just a few of those insights: things that we felt were intriguing, warranting further scrutiny. Few Belgian social enterprises are active in the domain of education, health or social work in comparison with other European countries. Yet we face enormous problems of unequal outcomes by socio-economic status in these domains. About half of all social enterprises engage in activities whereby they employ and/or train people from disadvantaged backgrounds. Social enterprises are mostly active in the domain of social service provision. The debate about the future of the welfare state and the role of social enterprises is very much ongoing. A strong welfare state like that of Germany may well have slowed down the rise of social enterprises compared to other countries with a more liberal welfare system such as the UK. There seem to be ever louder calls for more cooperation between social entrepreneurs, established welfare state organizations and policy makers. The concept of social enterprise began to surface in 2004. Most of social enterprises in China are in their early development stage and so far have demonstrated limited potential for job creation. About half of all social enterprises today seem to make use of social impact measurement tools like SROI and CBA. This is a very high percentage compared to monitoring and measurement practices elsewhere. Two-thirds of social enterprises seem to be located in Beijing or Shanghai. So there is a strong metropolitan area effect. Many social enterprises rely heavily on grants and are not financially sustainable. The use of social impact measurement tools seems rather low. Many social enterprises are finding it difficult to recruit talented people to work for their organization and the level of acceptance of the phenomenon 'social enterprises' in the market remains fairly low. Social entrepreneurship in Russia is in a transition period. The level of social entrepreneurial activity in Russia is among the lowest worldwide, only 1,2% of the adult population undertake it. But discussions on the definition and a growing awareness and public interest for social entrepreneurship are emerging. Many social enterprises serve socially deprived people. Women clearly seem to be more often running a social enterprise than men. Spain was the first European country to adopt the legal form 'social economy'. Social enterprises tend to be mature: the majority is over 10 years old. In order to lower the levels of unemployment and social exclusion, work-integration, training and education programs have been developed and reflect a huge current social challenge. The mean age of the sector is over 15 years, but there is an increasing rejuvenation of the sector with many small social enterprises popping up. There is an increasing awareness of the social enterprise sector, with a growing number of awards, articles in the media, grants, and political debates related to social entrepreneurs. Awareness of the concept is clearly on the rise, emerging from practice as social initiatives take place. Societal challenges related to aging population and unemployment (exacerbated by the financial crisis) are key areas for social innovation and entrepreneurship initiatives. The phenomenon of social entrepreneurship seems very concentrated around Lisbon and Porto. There exists very little data on social enterprises besides SELUSI data (This, by the way, holds true for many of the countries we study….). Mainly non-profit organizations are active, which carry out business activities in a complementary manner. The need to measure and demonstrate social impact is increasing. More initiatives are focusing on providing impact measurement support and standardizing the processes. Lack of, or limited access to, financing and funding is the most common barrier to start up and to grow a social enterprise according to social entrepreneurs. The government remains heavily involved in the field of social entrepreneurship. Examples of this are: improving the legal form for social enterprises, enabling a stronger social enterprise support ecosystem, creating demand for the services of social enterprises, etc. On September 4, 2014, Davis Plotnieks and Bogdan Prokopovych from the Stockholm Institute of Transition Economics (SITE), Stockholm School of Economics delivered a presentation on the SEFORIS project at the International Summer School on Social Entrepreneurship and Sustainability in Emerging Markets held at Tbilisi State University, Georgia and organized by the OIKOS Foundation. In the presentation, Plotnieks and Prokopovych explained the aims and benefits of the SEFORIS project, the latest research on social entrepreneurship and an integrated framework of research for social entrepreneurship and its financing modes. Plotnieks and Prokopovych presented examples of how academic research can help practitioners and researchers understand the complex field of social entrepreneurship and social finance. Plotnieks was also recognized as one of the three winners of the best social entrepreneurship case studies, for his case “Engaging Young Mothers in the Marketplace: The Case of Latvian Social Enterprise MAMMU“. The International Summer School was dedicated to social entrepreneurship topics where students from 18 different countries from Europe, Asia and North America acquired knowledge on social entrepreneurship, social finance and social innovation. Participants also discussed different business models and case studies of social entrepreneurship from their countries. During the International Summer School, the students worked as business consultants for Georgian social entrepreneurs and provided them with recommendations for their business model improvement. The presentation of the SEFORIS project in the International Summer School on Social Entrepreneurship and Sustainability in Emerging Markets presented by Davis Plotnieks and Bogdan Prokopovych can be found here. Amidst the vibrant and lively atmosphere of Shanghai, China, the Seforїs consortium members got together to kick off our international case study database. In preparation of the meeting all partners had identified outstanding social enterprises from their respective countries. When each consortium member presented their shortlist of possible case studies, it became clear on more time that there is a world of fascinating social enterprises out there. We had to make decisions such as: What are the most important criteria for selecting social enterprises to be studied in-depth in the Seforїs project? Which questions are most important to ask and analyse? On one thing we all agreed on was that we are going to end up with really intriguing cases! Exactly how rich and diverse the world of social enterprise is, became clear once again during the conference organised by NPI‘s Social Entrepreneur Institute (SEI) titled “The Rise and Practice of Social Enterprise in China.” Practitioners from the field of social enterprise in China as well as several members of the Seforїs consortium provided insights and opinions on the global climate of social enterprise and China specifically. The introductory talk by Windy Tan, senior analyst of SEI, made clear that both in- and outside the social enterprise community uncertainty still surrounds the term social enterprise. There is for instance much variety in the legal forms that social enterprises adopt, or the extent to which they operate as a charity or NGO. The academic community is often similarly divided on many of these issues. Within Seforїs we agreed to adopt a broad and inclusive definition of social enterprises - building on the SELUSI project - to establish a certain common ground that allows us to conduct meaningful comparisons across countries. One of the differences between the field of social enterprise in China and the UK that caught my attention is that in China the status of charity or NGO seems more common for social enterprises than in the UK. As of 2007, the legal form of community interest company (CIC) was introduced in the UK, a form specially designed for social enterprises. Although at the moment only a 5% share of social enterprises is incorporated under this form, see the country report State of Social Entrepreneurship in the UK, it suggests that social enterprises have greater legitimacy in the UK compared to China. Laura Tóth, a member of the Seforїs consortium representing NESst in Hungary, shared some of NESst’s experiences from practice and research in various countries in Latin America and Eastern Europe. One of the key challenges that Laura pointed out, is the sustainability and upscaling of social enterprise. A lot of attention for social enterprise has gone out to new start-ups, but it is just as important to make sure that promising ‘young’ social enterprises are able to access funds and investments to sustain an grow their activities. Again, a parallel can be drawn with the academic community, where the focus of the discussion has been on the emergence of social enterprises and much less attention has been paid to what makes social enterprises successful in the long term. Indeed within Seforїs we investigate how social enterprises can successfully scale their activities and their social impact. Summing up, the conference day at SEI showed that social enterprise is a dynamic and diverse field, in which opportunities for learning and research are abundant. Getting together in this field is a challenging and rewarding exercise!